"Looking back at photographs from that period, I was a pretty cantankerous young man! I was saying, 'I'm not trying to be a pop star', but you look at the photographs and clearly I was." Astute readers will already have clocked that the highly apposite headline for this issue's Cowboy Junkies interview, Margo’s Waltz, is also, funnily enough, the title of a sublime Lloyd Cole song. We tried to think of an appropriate Cowboy Junkies song to give us the title of this Lloyd Cole interview but no matter how we rephrased our questions or edited Lloyd's answers, 'Murder, Tonight, In The Trailer Park' never quite seemed to fit the tone. Instead, we've called it 'Failing Upwards' after our interviewee's own typically equivocal assessment of his career. You've probably known and loved the Commotions work for much of your adult lives so naturally we discuss that half of Cole's career but the Hearsay contingent have always nurtured a quiet obsession with Lloyd's solo work (from 1990's Lloyd Cole to '95's Love Story), too. It's hard not to associate solo LC with his residence in NYC and yet there's nothing terribly urban about these romantically pessimistic albums. Charged and wistful, sonically adventurous, they've also been consistently underrated. Anyway, it's no surprise to learn Lloyd's now left the city for more sedate environs. This is only one of many developments currently reshaping Cole's life and work as Ewen learned when the two chatted by phone late last year. There's a lyrical, self-designed website for you to check out, at least one new album about to appear and news of Lloyd's lucky escape from the world of 'not very clever' record company staffers and the tortuous games of major label promotion where even Terry Wogan can have a sinister influence on one's recording career. Read on! HEARSAY: What are we dragging you away from, Lloyd? LLOYD COLE: I'm designing a website. Well, it may be exciting for people who are interested in me. It's my site (www.lloydcole.com). I'm hoping it's going to be, if not exciting, then at least a pleasant experience. Going back to the very beginning, how did it all begin for you? When I was about 11 or 12 there was Marc Bolan and David Bowie and I think subliminally then I thought I wanted to be like them. It was around that time I decided I didn't want to be George Best. As to how it actually happened, circumstances were very pertinent in that if I hadn't hooked up with the people I hooked up with in Glasgow I'm sure I would not have made those records or written the kind of songs I did. When we started out, I had it in my mind that I wanted to make records not dissimilar to Scritti Politti; I'd been listening mainly to R&B music and because of that I thought I could do some kind of Young Americans-type thing. But when the band formed we were so intrinsically white we naturally developed the style we had. We never consciously decided on a country-ish, Velvet Underground-­ish, Byrds-ish kind of sound - we sounded like that because of the way we played together. We had band members coming from very different perspectives in terms of music, none of us really saw things the same way, which was a great advantage. Blair [Cowan], the keyboard player, liked Steely Dan at the time and I thought Steely Dan were really the antichrist. Lawrence [Donegan], the bass player, was really into the punk-rock aesthetic of things and country music even before I was interested in country music. Neil [Clark] had learned to play guitar with a jazz tutor. Stephen [Irvine], the drummer, had played God-knows everything and was able to do pretty much anything we asked him to. I can easily imagine reaching the age of 25 or 26, if these circumstances hadn't happened, and not having become a songwriter. Listening to your 80s albums again recently, particularly Rattlesnakes from 1984, I was struck by how little they've dated. But they're not very '80s' either - did you have a lot of artistic freedom even back then or were there attempts to groom you for pop stardom? Well, they have dated a little bit! We were being groomed, but when Rattlesnakes was being made we made it in two parts. We recorded Forest Fire, Perfect Skin, Are You Ready To Be Heartbroken and a few B-sides to start with and after that we decided Perfect Skin would be the first single. The record company had wanted Forest Fire to be the first single. After Perfect Skin launched and did way better than we expected we were pretty much able to steam-roll our way through the first album and do what we wanted to do. We had a great producer, Paul Hardiman, who seemed to understand how to get the best out of us. We were so inexperienced, we didn't think there were alternative ways of doing things, so we didn't have months and months in the studio thinking could we do this or try a bit of that. Before making that album we'd only been into a studio to make a few demos so there was a wonderfully direct approach to the making of Rattlesnakes - it was the sound of the way the band played live, with strings. Did success come as a surprise? Well, there were other records around at the time. REM in America, things that the Smiths and Aztec Camera were doing. We weren't exactly out on a limb. But to be honest, from that period, other than Rattlesnakes, the records that still sound good are the synth-pop records - the Human League, Soft Cell. But we were surprised. We had a band lottery where we all bet on what number Rattlesnakes would enter the album chart at and the highest bet was 28. Then it went in at 13 and stayed in the top hundred for the whole year which was bizarre. On that first record the momentum was so strong and the results were so much better than anybody expected that we kind of got away with it with the record company. The interference started immediately after that record. I forgot to ask Stephen Duffy when we spoke to him what it was like being an 80s pop star... with all the demands that entailed, like having to appear on kids TV. I'll ask you instead. It was bizarre because we never really had an opportunity to establish a perspective on where we were or where we stood. One of the things that's been interesting, building a database for this website, is I've looked back at photographs from that period and I was a pretty cantankerous young man! I was saying, 'I'm not trying to be a pop star', but you look at the photographs and clearly I was. I wouldn't have allowed anyone to take photos of me like that if I didn't want people to like me. The problem was that things were moving so quickly, there's so much demand for you to do this or do that, you never grasp exactly where it is you are. I find that a lot of people who make the best music are very subconscious about the way they do things - they don't analyse what they do and we didn't have time to analyse what we did. Do you see a natural evolution in your work or does it fall into distinct stages? With the Commotions we never even thought we'd make it through three records. When the band split up, my intention was not to become a solo artist but to find out if I might be able to become a solo artist. I wasn't aware of having any of the skills that I thought might be necessary to make a record on my own. My job in the Commotions was that I sang, played guitar and wrote songs but I didn't specifically instruct people on how to do things and I didn't realise, until I moved to New York and got a drum machine and a little eight-track thing, that somehow over the years I had absorbed all this information and I could play guitar better than I thought and I could programme drums which I'd never done before and I was able to do string arrangements even though I'd never tried before. Those five years of being in the Commotions I guess I'd learnt a lot from those around me. Neil Clark is probably the most important person I ever learnt from in terms of knowing what you can do with the guitar - I owe nearly everything to him. Each of the solo albums has a very different feel... is each one a reaction against the last? The Commotions' albums kind of flow into each other even if they're not the same. The solo albums, by contrast, are very jerky. Until I made Love Story (1995) there was a feeling I had that it was the artist's job to constantly push himself into new areas, to be pushing the envelope, as people say. I hate phrases like that - it's like 'cutting edge'. Anything that anyone says is cutting edge is never cutting edge. But I always felt it was my job to try and branch out, to not stand still. I think that's really the key to my lack of long-term success! I've been quite nicely successful, but if you think about how a group like REM has done, compared with how I have done, REM quite clearly did one thing and honed that one thing as well as they could and I didn't do that. Sometimes I think perhaps I should have done. I wanted to call my collection album that came out last year Failing Upwards because that's what I've done. I've had an awful lot of failure trying to do this or do that and when I finally made Love Story I was persuaded to finally sit down and write some songs on the guitar again, which actually seemed like a novel idea! I think Rattlesnakes and Love Story are the only albums whose flaws I can live with and those were the two albums that were made relatively subconsciously. On the other hand, I am pleased that I did try and do things, even finding out I wasn't so good at them. I'm glad that I didn't try and be like REM or Van Morrison. I'm happy to have failed. And, you know, the Negatives record doesn't sound at all like Love Story. It can be just as interesting for the audience as for the artist when someone tries something new on each record. I hope so. Every time a new record of mine came out, especially Bad Vibes, I found myself thinking 'I've made an album that doesn't sound like a Lloyd Cole album', which probably wasn't a smart thing to have tried to do but it was what I was trying to do. What I found incredibly frustrating was that everyone said it sounded like Lloyd Cole only just a little bit different. There was no question that I'd come anywhere close to succeeding in not sounding like a Lloyd Cole record. So maybe there was no point in trying! The way I think these days, in terms of making records, is not so much not wanting to sound like myself, but trying to figure out what kind of record I might be able to have a good shot at making. I probably won't try and make an orchestral record again, much as I love the orchestra on that record, I don't think my voice was strong enough against a full orchestra. Acoustic guitar, on the other hand, I can just about keep up with. I'll probably make an entirely acoustic record in the next couple of years. What inspired the orchestral record [Don’t Get Weird on Me Babe, 1991]? To be completely honest, at that point in my life I really did believe I could do absolutely anything because nearly everything I tried on my first solo record came off. There are some fabulous failures on it but that's probably my favourite record even though it's flawed. There are some ridiculous attempts to play rock and roll on it but I do love them and I'd be very pleased if people were laughing at me as they listened to them. Was there any particular reason for the clear split into two distinct styles (orchestral versus rock and roll) rather than adhering to one or other throughout? There was a CD edition (promo?) which issued it as two separate, six-track mini albums. It was partly circumstance because Blair had written these tunes with synthesizers and it occurred to me that they might be beautiful with an orchestra. He wrote five of the six tracks on the orchestral side - I only wrote Butterfly. I maybe co-wrote a couple of the others. At the same time, I was busy writing the most basic rock and roll type songs I ever wrote and I felt like I wanted to be perceived as somebody who was not one-dimensional and this would be a good way to do that. Of course, I was completely wrong - it was by far the biggest mistake of my career - the orchestral tracks never got heard outside of the people who bought the record. Anybody who likes my music would probably say two or three of those tracks are among the best things I've done, even though they are glorious failures. But the fact that none of them got heard on the radio that year was pretty devastating to me. I remember hearing Butterfly on the radio once or twice. Just about! It came out as a single literally as I was leaving Polydor. What happened when that record came out was that I'd agreed to release She's a Girl and I'm a Man as the first single if There For Her or a track from the orchestral sessions was the second single. She's a Girl was knocked out in the studio as a B-side idea - we'd been playing a T-Rex song earlier that day, not dissimilar to the way the Smiths came up with Panic after, rumour has it, playing around with Metal Guru which is only one chord different. When I delivered the album, Polydor had a complete blind belief that She's a Girl was a smash hit single, to the extent that they gave me more money than I'd ever had in my life to stay with them. It was quite strange because when that single wasn't a hit there was no Plan B and I'd been booked to do the Wogan show and Polydor told me that the Wogan show wouldn't have me on if I played an orchestral song. So they pressed up Weeping Wine as the second single without telling me and that's when I left them. All momentum on that album was lost after the first single which was very sad, but that's the way things work with record companies. There's some not-very-­smart people working for them. If I thought that getting into music meant the Wogan show would be choosing my singles, I would not have gone into music. Did the move to NYC affect the landscape of your songs? Do you visualise any of them as still taking place in UK? The Britishness hasn't disappeared from your turns of phrase ('save yourself a fiver, you're already soaking...). Certainly some songs are specifically referring to British things. Generally most of my songs deal with the way men and women live together and that's not radically different from France to Germany to Nebraska, you know? I remember one of the funniest things about where a song was located was when I wrote Charlotte Street. That was supposed to be located in a library and it wasn't till two years after the song's release that I realised I'd neglected to make reference to the library anywhere in the song! It'd been in my head the whole time I'd written it and I'd just forgotten to put it in. I think one thing about being away from Britain is that it does make you appreciate the country more - you can see it better. The one thing that the British would probably never ever want to be called is ‘quirky’, which is probably the most appropriate. Overall, I think, Britain is a very quirky country, as shown by Blur, who are probably the best British group of the last ten years. Fantastically British and undoubtedly quirky. It's very English, actually. For the most part I'd say Scottish people were less quirky. From this distance you can see how unique Britain is and how strange it is that Britain still perceives itself to be the centre of the universe, whereas nothing could be further from the truth. France is closer, to be honest. I like and enjoy the distance. I'm glad I don't live in London anymore. If I'd stayed in London I'd have certainly given up music by now. There have been so many times in my career in Britain that I have been quote-unquote over that I think it would have worn me out. I've never been either happening or over in America, so I just exist. Your songs still have a vivid sense of place (even if it's not a specific place) and timeframe - I was thinking specifically of the filmic ones like Downtown and Unhappy Song... does that infiltrate the creative process? 'Lucy jumped from the 39th floor' is a great opening to a song and you often deliver opening lines that grab you, like in novels or short stories. Is that unconscious again? I can't remember who said it but recently someone told me that I had more good first lines than anyone else they could think of. People I'm a fan of, like Joan Didion, if you read the first line to any of her books it just makes you want to read the whole thing. Last night I re-read the start of the Book of Common Prayer which is probably the best of all the intros and I'm just completely in awe. The best advice, I think, to people wanting to make art is to imitate the people you think are great and if you've any kind of voice of your own then it will be heard and if you just sound like an imitation then you should give up. People are so scared of imitation when they are young; I'm not afraid of it anymore at all. The only exception for me is with my voice - sometimes I have consciously imitated people like Bruce Springsteen and Roy Orbison and that's not a good thing for me to do. Do the people you allude to in your songs appreciate the references to them? Jane has never been in touch. She's the only person to have their name in a few songs. She had the audacity to leave me when I was young! She's been rewarded, usually with pleasant references. The song Grace was inspired by Edwyn Collins's ferocious bitterness at the age of 28 and yet the song is not specifically about him. But I called him a big jessie because he is a big jessie. It's like How Do You Sleep - everyone said that was from Lennon to McCartney and Lennon said that the longer he lived the more he realised it was about himself. Not many of the characters are from my life. At the beginning of my career I found my main limitation as a songwriter was that I made most of my characters use my vocabulary. When I realised I was doing that I tried to stop which has maybe made the songs less pleasant to hear. My songwriting vocabulary has been largely determined by pleasing sounds - you like the way certain words sing. Without thinking, they just keep popping up in the songs. On Rattlesnakes there are phrases that are repeated several times in different songs and I didn't really realise at the time. I guess we got away with it. Adam Peters was an intriguing choice of collaborator for you - we knew him first through his work with The Triffids. How did you two hook up and what's he up to now? He's living on 7th Avenue at the moment. He's got a girlfriend from Austria and a group called Family of God and he seems very happy. He did a remix of Butterfly which was just wonderful. At the time I wanted to go further with being less like myself and what he'd done with something I'd written was far more radical than anything I had done. I asked him to come to New York for a while and see if we might do some work together and he's been here ever since. And it's interesting to see Jill Sobule is in your new band the Negatives... how did that come about? Being a singer-songwriter in her own right, it must alter the group dynamic. I went to one of those songwriting seminars. I never go to them normally but this one was in Ireland near a fantastic golf course that I'd been meaning to visit for several years and I thought if I go to this conference I can maybe play the golf course. Jill was at the seminar and Charlotte and Jane from the Go-Gos and I wrote a song called So Jill, Sobule. It was funny because all these people were getting together for these serious attempts at writing charting hits and we wrote a punk-rock song about Jill because we thought she was cool. I was very sceptical about the whole event at first but I had a wonderful time and met some inspiring people. Liam, from the Hothouse Flowers, for example. If you meet him you realise they are one of the greatest underachieving groups of all time. He's an absolute genius when he sits down at the piano - I was completely blown away - and yet something stops them from making really special records. Around this time my record company were planning on releasing a Lloyd Cole compilation and they wanted two new songs. Love Story had done far better than anyone expected - I even had an almost bona-fide hit single from it, so obviously these two new songs both had to be hit singles! I said to them 'look at my career - seven albums and four hit singles - I'm not exactly the best guy to ask to sit down and write two hits. I did quite a lot of writing and I wore myself out. I did some co-writing - I went to Andy Partridge's house for a couple of days and did this and that and by the time I was done with trying to write these songs I just sort of gave up. That's when I formed the Negatives and started playing some shows - to do something different. Sitting around with this weight on your shoulders having to deliver these songs - I realised that I was never going to write like that again. I haven't written a song for about a year. There are half a dozen songs I was working on about a year ago, but I've also got an album-and-a-half recorded - songs that have never come out. I don't really want to have two-and-a-half albums finished. If a song comes to me then I'll write it and if it doesn't and I don't write then, frankly, that's quite nice. So where does that leave the Negatives' release? It'll definitely be out in the new year. It's coming out in France in the early spring. It'll be out one way or another, even if it's an internet thing. All that remains to be done is the album sleeve and the mastering. There's a problem I'm having with a record company that I can't really talk about but overall, I've been very lucky with my record companies during my career. Nothing really bad happened until my most potentially lucrative years were over. If you had to choose a celebrity to stalk, who would you pick? If you're going to stalk somebody it should be fun. I think I could probably have some fun stalking Neil Tennant. I've sort of half been stalking him over the years in terms of every time we meet we're really friendly and I always think that it'd be great to do a song with the Pet Shop Boys but they never call me. So I guess it'll never happen! If they asked me if I'd sing something I'd say yes in a second. They and Air are probably the only people I'd say yes to. 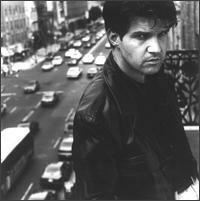 Who would best play you in the TV movie of the Lloyd Cole Story? Oh, the guy who played Angel. Do you have Angel over there yet? Do you have Buffy the Vampire Slayer? Angel's the boyfriend in that. He's got fat cheeks like me. I'm sure he could try and look sheepish and handsome at the same time which I now admit to having tried to do. I'm now going to go and eat my supply of English food. It's pathetic. I've got Branston Pickle and I've got Twiglets. So I'm going to have a cheese and Branston Pickle sandwich and Twiglets for my lunch. My studio is five miles from my house so I have a packed lunch and a Thermos. It's in a wilderness - there's a coffee shop, which is terrible, so I just bring my own lunch. I'm like someone from Coronation Street.